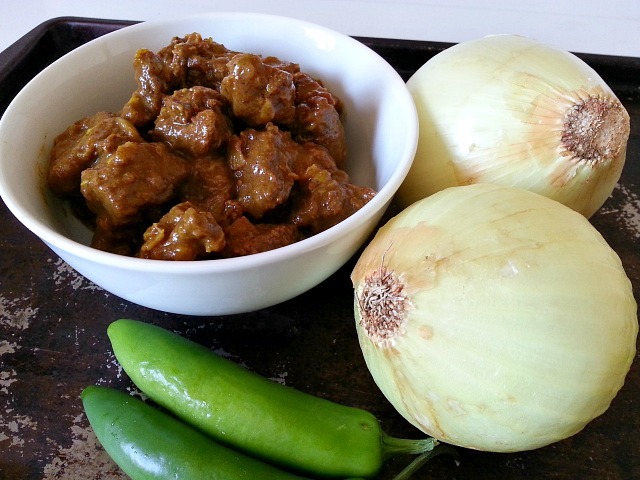 This recipe of Beef Chilli Fry brought back a lot of memories during my teenage years. It’s a smart way to use leftover cooked beef like the one I used from my last weeks recipe Beef and Potato Curry. A simple 2 step process with just 3 ingredients. 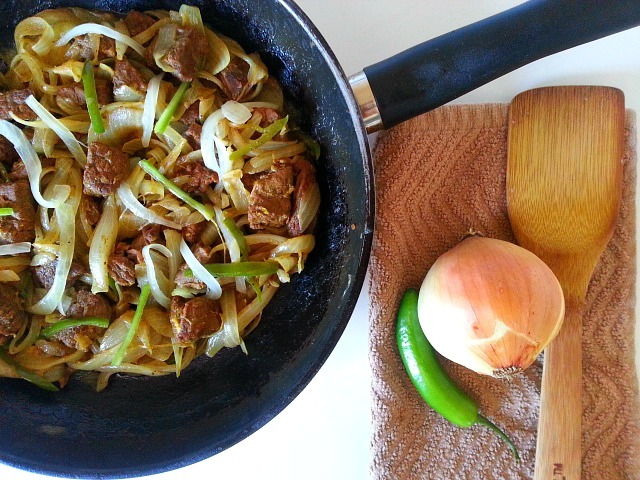 Leftover beef, onions and green chilli/ jalapeno. 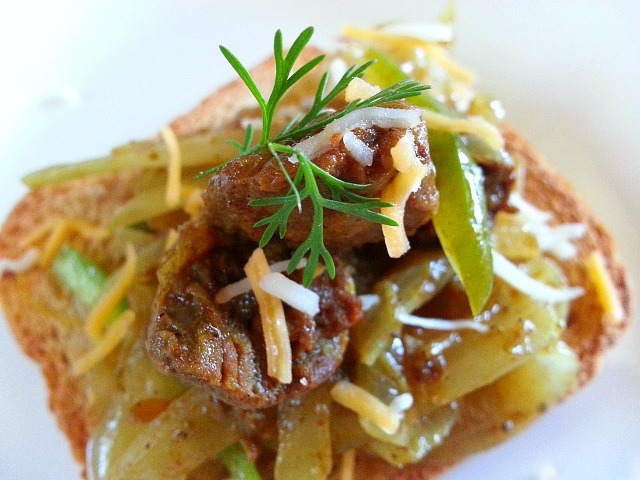 The flavor of the cooked beef and sautéed fresh jalapeno and onions give the recipe its distinct flavor and taste. what more can a cook who loves to cook easy delicious recipes ask for. You can eat it for brunch, side dish along a meal or be creative. In my earlier post I had mentioned that Indian breakfast are more savory. My childhood memories of breakfast are of fresh-baked bread, butter, cheese, eggs, salami (which is a smaller version of Italian mortadella) or chapatis (rotis). Plain Corn flakes where available in the 90’s and oatmeal was only when you were sick. My siblings and I enjoyed making this recipe on Sundays after church for breakfast. It was something different from the usual along with some cooked down leftover Goan Prawn curry. In a hot pan add oil and saute the chopped onions and jalapeno (chilli) till the onions are translucent. Next add the beef and saute gently till well mixed and heated. Serve with bread or rice. 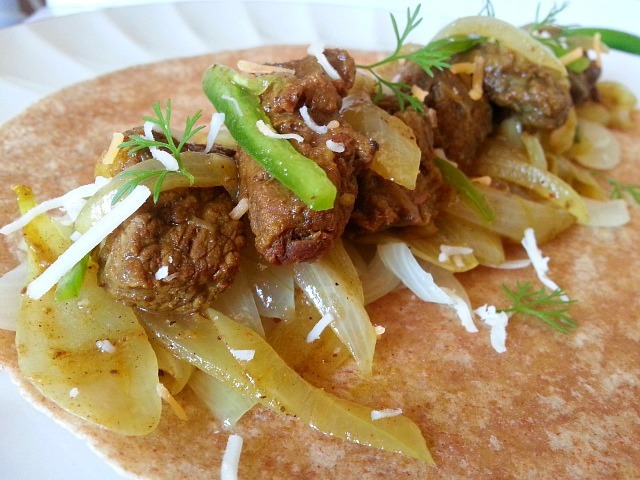 Make a Beef Chapati Kathi Roll or Tortilla Roll. As a mid-day snack serve it on a crostini or toasted bread. You could drizzle a yogurt sauce or some pico de gallo. That looks and sounds very similar to a Peruvian dish called Lomo Saltado. Thanks for sharing your delicious recipes. You are so welcome Elenis and Thank You 🙂 . Yes…. Lomo Saltado, I tried it for the first time this February. It was delicious at a Peruvian restaurant called El Rocoto in LA. This looks absolutely delicious! and your presentation is absolutely stunning! Thank you so much. I appreciate your kind words :-). Thank You Rohan for the re-blog. That was very kind of you. Hey, can I ask you to re-subscribe to http://www.urbanmonique.com? Lost all our subscriber data in relaunch, dangit! This is great. I’m always trying to find new ways to use up leftovers. Kiddos to u Nandini. All u’re recipes r so real & just like any goan home’s everyday cooking. There r a lot of blogs with goan recipes but they all have std popular recipes which represent Goan food which is nothing wrong but for everyday cooking & the real deal its coming back to your blog like actual way Coriander Chutney is made for sandwiches the goan way, Pumkin and Shrimp Goan Curry, Caldo Verde,Garbanzo with Xacuti Masala,Beef Chilli Fry, beef curry with potatoes,patties, goan beef stew, Goan Beef Roulade, Xinaneao Fry,Tisreo Xec Xec,Almondegas de Peixe, the type of fruitwe actually make at home, the steamed bread pudding as not everyone had an oven at home, moog dal gorcsem. THANK YOU & WOW! Just can’t wait for the bol, bolinas pinag the simple basic yellow prawns chilly fry, caldine made with big chunks of cabbage recipe posts by you. yum yum! It was gr8 talking to u last time, just like your recipes u sound so real, humble & down to earth. Love u gal! P.S. could not get the FB code u were talking about. Wow! This looks wonderful! I am a “Hot stuff” baby, but I can stand a little spice so I am going to try this. I am all about easy-to-prepare meals, as I work 12 hour days, so I am excited to try this. It looks delicious! Thanks so much for sharing your wonderful talent. Thank You so much. Please let me know how it comes out. You can de-seed the jalapenos to make it less spicier. 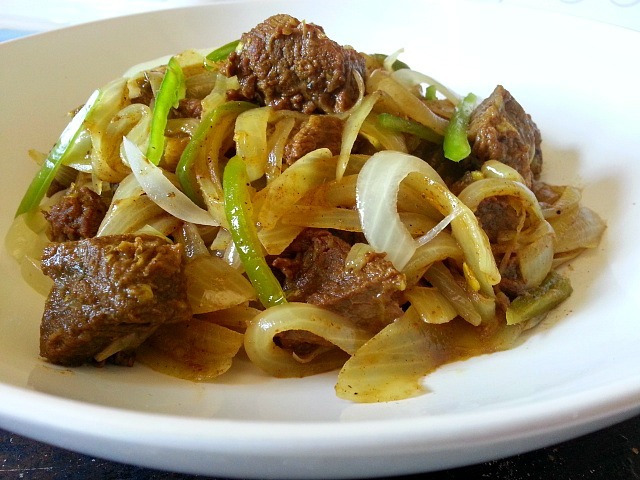 Beef chilly fry. This looks amazing. Will give this a go ASAP. The Mrs is back from Goa, refreshed. Looking forward to some delicious food. Bingo! Beef chilli fry is a good start. Thank You very much for this recipe. Thank You so much Mr Stan. It is awesome to know that Mrs Stan is back and I am sure you must be looking forward to all the good food she will be making. Regards to you both. Take care. The dish sounds delicious and surprisingly easy. The images are spectacular – especially the first one with the tack-sharp focus on the greens on top. I can almost taste it. Thanks. Thank You Darryl. I too was surprised the way that shot turned out. I guess it was my lucky day with my phone camera. Thank You Jueseppi very much for the re-blog. Thank You so much and a Happy weekend to you too. I am sorry to have been missing your posts. I do apologize. As I have been getting online either much earlier or way later. My favorite kind of cooking! Beautiful photos. Nice way to take advantage of leftover! It looks delicious! I love the composition you made with the saute pan. Well done indeed!